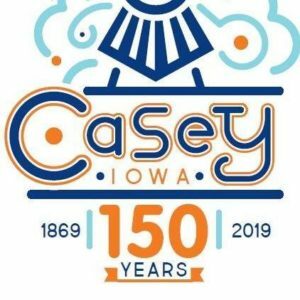 The Casey Service Club will once again host the annual Casey Fun Days on Friday and Saturday. The weekend’s festivities begin with Bingo at the Visitor Center from 6-7pm. 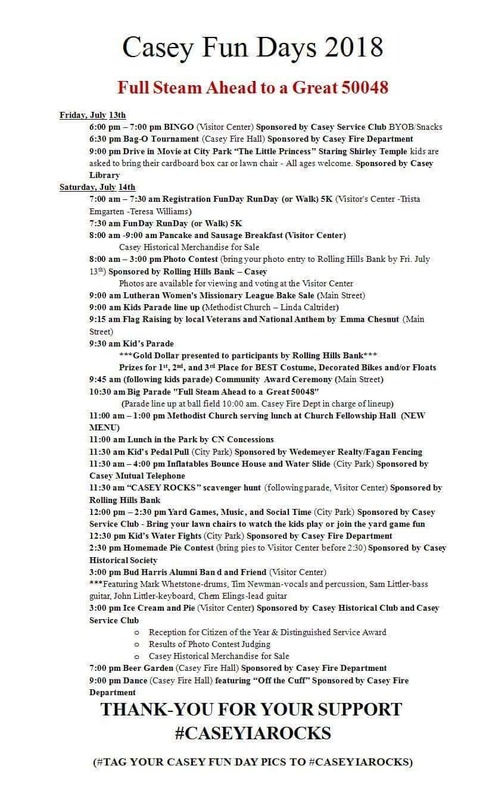 There will also be a bags tournament starting at 6:30 at the Casey Fire Hall and a Drive-in Movie at Abram Rutt City Park starting at 9. Saturday’s events begin with the “FunDay RunDay” 5k run/walk at 7:30am. 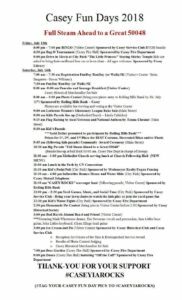 Other highlighted events throughout the day include the Kids Parade at 9am, the regular parade at 10:30am, and the Homemade Pie Contest at 2:30pm at the Visitor Center. The celebration concludes with a dance at 9pm at the Casey Fire Hall, featuring music by Off the Cuff.